No images of Australian Sun Power Installations. Australian Sun Power was a solar power company operating throughout Victoria and NSW. Its Head Office was in Melbourne, with a branch office in Sydney. I bought a 5 kW system from this company last November, and now my mother has bought a 5 kw system also- very happy so far. Hers is slightly more in cost but better panels were fitted. 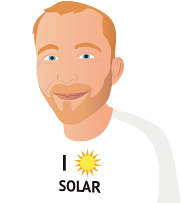 Your web site helped a lot with our decision to go solar. The quotes and information from the companies that your site got to contact us were a help too. I was impressed with all of them from a knowledge, customer service point of view and at the end of the day we only chose who we did based on comparable products at a lower price. Have not had a bill yet to prove how good the system. Very good value for money and it was installed within 2 days of my deposit being paid!